Chelsea Paige displays a new Mori Lee prom dress that will be available at the ninth annual Prom Dress Swap this weekend. IRON MOUNTAIN — A generous local resident purchased a brand new Mori Lee prom dress for the ninth annual Prom Dress Swap today and Sunday at the Dickinson County Library in Iron Mountain. The donor asked the library what sizes were needed for the swap. The dress that was purchased is a size 14. Sizes range from 0 to 14. They will also have a seamstress on site this weekend to help girls with some alterations if needed. The swap will be open from 11 a.m. to 5 p.m. today and from 1 to 3:30 p.m. Sunday. 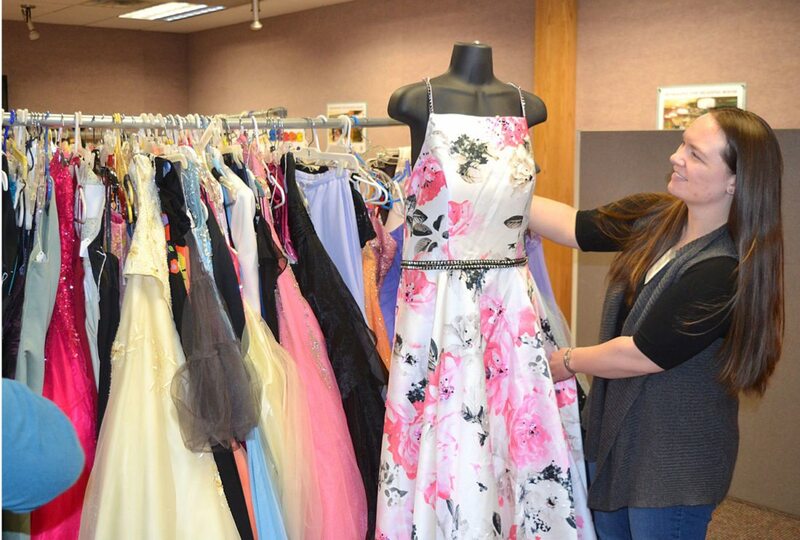 Promgoers — teen girls in ninth through 12th grades — are invited to attend the swap to take home a free formal dress and items from a selection of jewelry and accessories. The first hour of the swap, which is set from 11 a.m. to noon today, is reserved for those who have a ticket, which can be obtained by donating a dress. Teens who do not donate a dress may attend the swap starting at noon. While prizes last, teens attending the swap may instantly win prizes from area businesses for hair, nails, tanning, dinner, flowers and more. Donations of dresses, shoes, jewelry or other accessories are accepted for the following year at anytime. New this year is a chance for donors who are not attending the swap to have a chance to win a prize from an area business by leaving a name and phone number when donating.